Gain control over every aspect of your hosting solution with custom dedicated servers. variety of base configurations before customizing the hardware and software for your applications. Please write to support@servermania.com or start a chat. * Setup Times thresholds and fulfillment subject to order volume, location capabilities, order verification and hardware availability. ServerMania offers dozens of Operating Systems to choose from to ensure you have the right software available. You can find a variety of free Linux options as well as Windows Server. Each OS will be immediately installed after checkout, or choose to install a custom OS using our Surge control panel. hosting, and any other application that demands the ultimate in power and long-term stability. +Why might I select a dedicated server over a hybrid or virtual server? 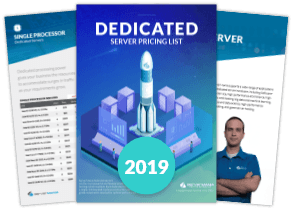 Dedicated servers are the ideal choice for resource-intensive applications that require the resources of an entire server. You will not need to worry about other users impacting the performance of your application as the entire server will be dedicated to you. +How quickly are dedicated servers provisioned? Dedicated servers are typically provisioned within 2 to 24 hours. +What is the speed of the server’s network port? Every server is equipped with a 1Gbps network port. +What operating systems are available? We offer CentOS, Ubuntu, and Windows operating systems. You can also install your own OS using the included IPMI console. +Is a dedicated KVM and remote reboot available on my dedicated server? +How quickly can I expect a response to any support questions? We are proud to offer 15 minute response times for all technical support requests. +Is there any DDoS protection included with the server? We offer 1Gbps of free DDoS protection included with every server. Additional DDoS protection is available for an additional fee. +What happens if a component of the dedicated server fails? ServerMania will quickly replace any failed server component as quickly as we can.